Costanzo is a Canadian actor of Jewish-Italian ancestry, from Brampton, Ontario. His mother is a singer-songwriter. In addition to various television productions, Costanzo has also performed on stage in Canadian productions of Bogeyman and The Good Doctor. In his elementary school years, both of Costanzo's legs were broken when he was involved in a car accident. Paulo kept the staples from this incident for years afterwards, in a jar on his mantle. For high school, Paulo attended Balmoral Secondary School before transferring to Mayfield Secondary, the local school of the arts. In high school, Costanzo starred as Tony in his high school's production of West Side Story. Also, his class put on a Friends parody, in which he played Ross. Costanzo later commented to The Toronto Sun that, "I had a cold so I sounded more like a Jewish old woman than Ross". In 1998, Costanzo scored his first truly major role in the TV series Animorphs. His film career started in 2000, when he played Rubin Carver in the DreamWorks movie Road Trip. Reportedly, he had some on-set conflicts with director Tod Phillips. From there, he played Alexander Cabott III, the light-brained friend/manager of the fictitious pop-rock band Josie and the Pussycats, in the movie Josie and the Pussycats. More roles followed, including Troy in Gypsy 83 as Ryan, opposite Josh Harnett in 40 days and 40 nights, for Miramax, and as Stu, in the independent project Scorched. 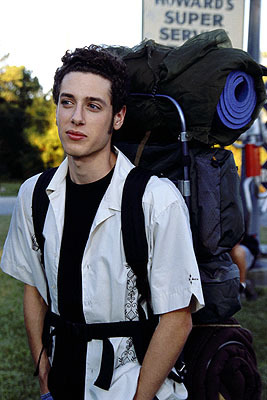 In 2003, Costanzo starred as Laurie in the Canadian comedic film A Problem with Fear, or Laurie's Anxiety Confronting the Escalator. "I'm very insecure. I have low self-esteem just like a lot of actors do."